Love it! Please tell me you are going to have a few copies for sale, maybe even a few variants. Blue moon goodness! Looking forward to the drop. ~ Cheers! Spectacular Marq…”Supermoon” delights skywatchers.A Lunar treat indeed. Incredible!!!!!! Hope you will have some for sale! ah, this would like nice side by side with the Grizzly Adamz poster. Loved the poster sadly it sold out early. I hope I get one in the drop. Any hints on when you will have a few for sale? Got the Tshirt version, love it! There will be a limited artist edition available in the future . . . sign up for the mailing list to get the scoop. 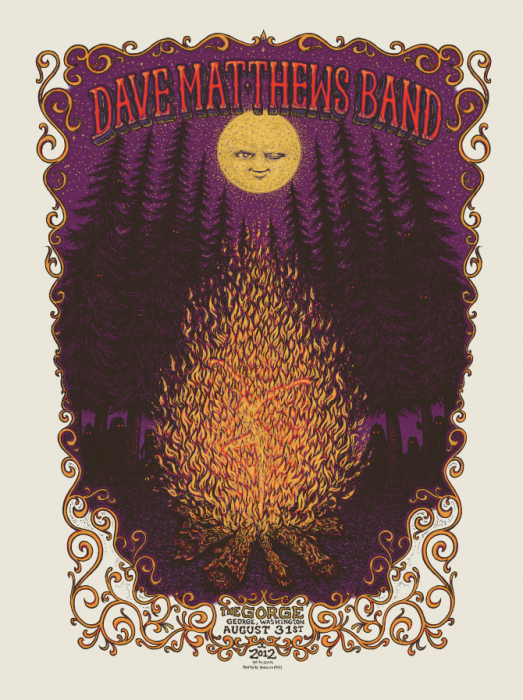 Interested in 2012 Dave Matthews gorge poster! I LOVE the hidden Sasquatches in the tree line…very funny! The hats & the one waving…teee heee! This was my girlfriend’s first trip to the Gorge, and all of us have a ceremony for the newbies at the top of the lawn. Afterwards, I ran to every merch stand, only to watch the last of these posters sell-out before I could buy one… SO disappointed! This is by far the best of the three posters for 2012, and I really would appreciate being able to buy one for my collection – especially if a variant is released. Please keep me posted!